Since Santa came to visit this week, I have two new gorgeous pieces from the house of Prada! I found this bag a couple months ago at Neiman Marcus and immediately fell in love. Being blonde and blue-eyed, I’m strongly attracted to light blue hues, and this baby was a knockout. Since I knew that’s what I was wanting for Christmas, I started acquiring a number of new pale blue pieces like this soft sweater (also comes in a number of other shades and is the perfect wardrobe staple) and I’m thinking of investing in these killer Gianvito Rossi heels – don’t you think they’d be a perfect match to the bag? 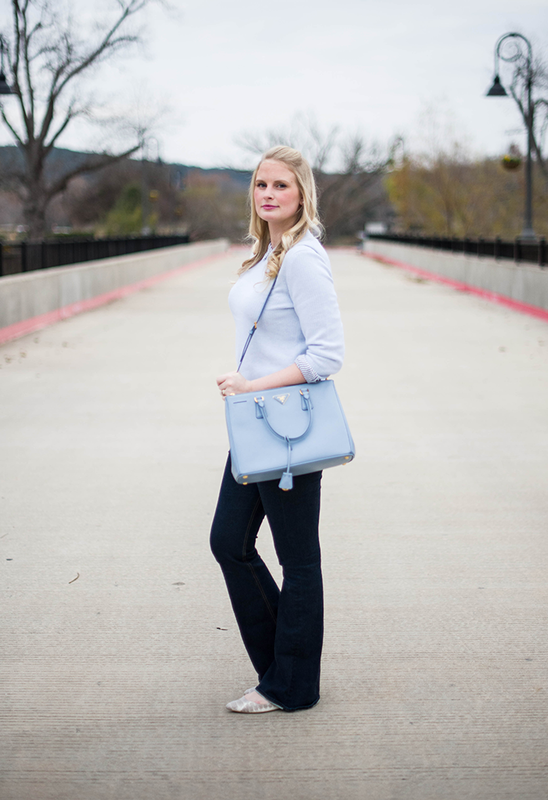 Shop more of my ice blue favorites below the outfit credits! The other piece of Prada are these cool geometric sunglasses. I’m also obsessed with this tortoise pair. They’re so unique! PS – you may have noticed already, but I hadn’t quite made up my mind about the leather tag on the Prada bag, so I removed it then added it back. The only problem was, I re-attached it to the wrong place and didn’t notice until I was editing these photos. Bloggers have bloopers too! Next time you see this bag, the tag will be attached to the hardware, not the handle. ooh I love your new bag and those sunnies are killer. Baby blue sure is your color, you look gorgeous. This is such a dreamy bag. I’m with Rachelle, baby blue is definitely your color. Hope your holidays were lovely! 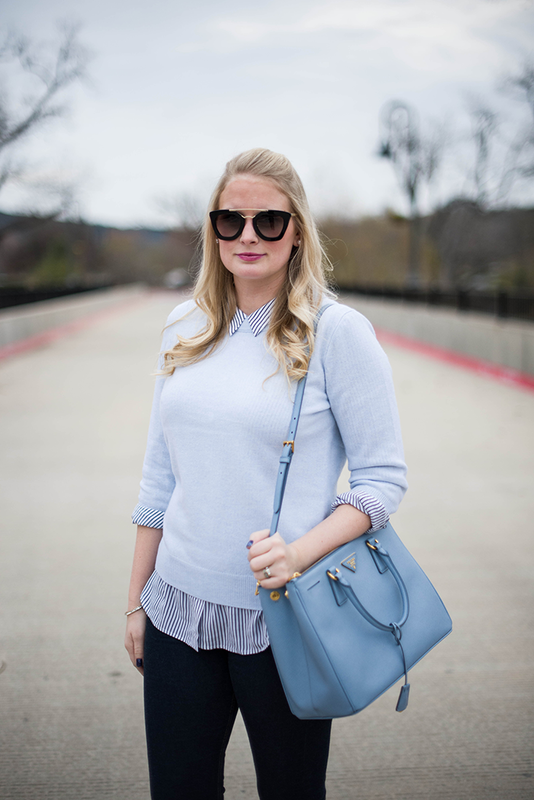 Light blue is a great color on you! 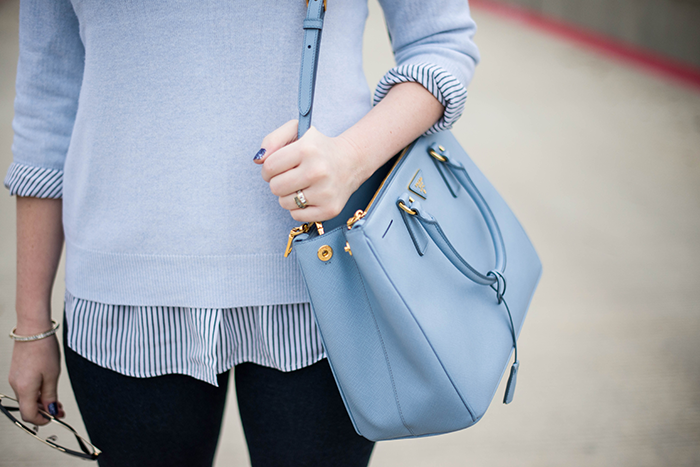 I am so in love with that bag – its at top of my list right now, in light grey. I just cant decide whether I want the version with the shoulder strap or without. What are your thoughts? This light blue is just gorgeous. love. love. love. and love this location! Why can’t we all move to Austin??? With blue being my favorite color I absolutely love this post! Oh and the color of the bag is kind of perfect, in my opinion. And I don’t know if they are Prada, but Olivia Palermo has a similar pair of sunnies that I love! what a great bag. the color really complements your eyes. OBVIOUSLY CAME HERE TO SAY I LOVE THE PRADA!! :) It’s gorgeous. 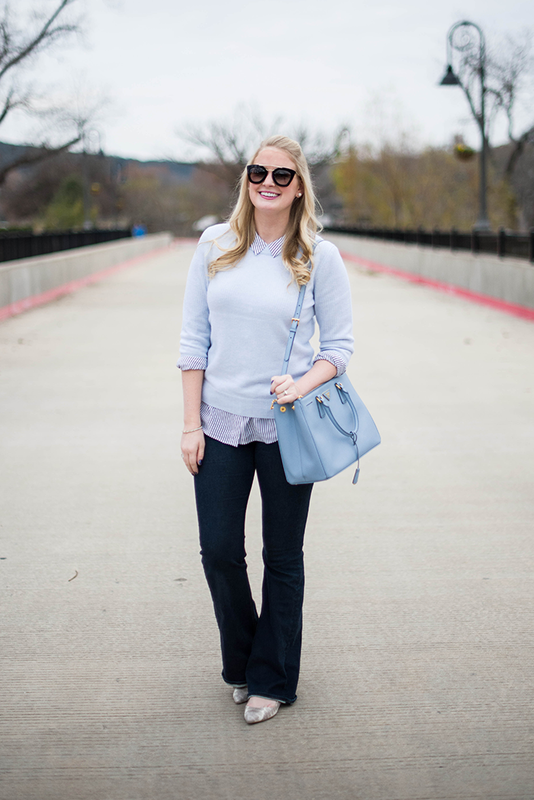 I’m such a handbag girl…and the sunglasses are awesome! Cute bag, hope you had a great Christmas! ahhhh so pretty! those sunglasses are incredible! so unique! Obviously I love the prada but those sunglasses are so unique, love it! beautiful outfit my dear. the colors are fab and the bag is a dream! 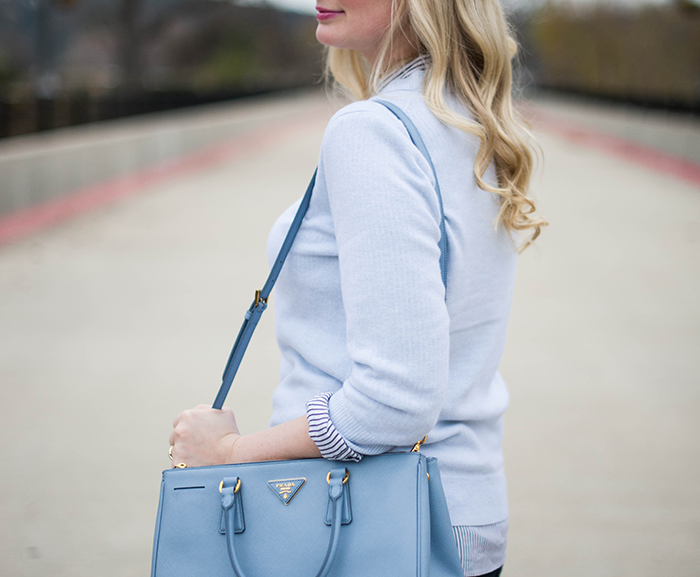 That baby blue Prada is pretty much perfection! Love color scheme on you! Ah that bag is insanely gorgeous. You look beautiful in the light blue. The baby blue is SO pretty!! 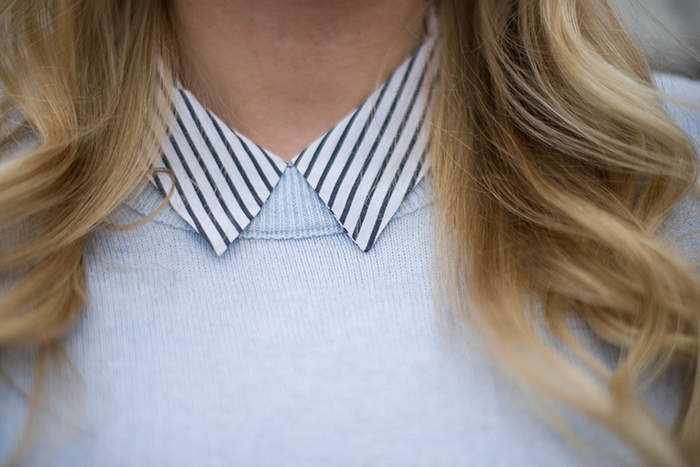 love this on you, a little preppier but still you!